Endospores were first described by Cohn in Bacillus subtilis and later by Koch in the pathogen, Bacillus anthracis. Cohn demonstrated the heat resistance of endospores in B. subtilis, and Koch described the developmental cycle of spore formation in B. anthracis. Endospores are so named because they are formed intacellularly, although they are eventually released from this mother cell or sporangium as free spores. Endospores have proven to be the most durable type of cell found in Nature, and in their cryptobiotic state of dormancy they can remain viable for extremely long periods of time, perhaps millions of years. When viewed unstained, endospores of living bacilli appear edged in black and are very bright and refractile. Endospores strongly resist application of simple stains or dyes and hence appear as nonstaining entities in Gram-stain preparations. However, once stained, endospores are quite resistant to decolorization. This is the basis of several spore stains such as the Schaeffer-Fulton staining method which also differentiates the spores from sporangia and vegetative cells. Left. Bacillus thuringiensis phase micrograph. Endospores can be readily recognized microscopically by their intracellular site of formation and their extreme refractility. Right. Bacillus anthracis Crystal violet stain viewed by light microscopy. Endospores are highly resistant to application of basic aniline dyes that readily stain vegetative cells. Below. Spore stain of a Bacillus species. CDC. The staining technique employed is the Schaeffer-Fulton method. A fixed smear is flooded with a solution of malachite green and placed over boiling water for 5 minutes. After rinsing, the smear is counterstained with safranine. Mature spores stain green, whether free or still in the vegetative sporangium; vegetative cells and sporangia stain red. Endospores do not form normally during active growth and cell division. Rather, their differentiation begins when a population of vegetative cells passes out of the exponential phase of growth, usually as a result of nutrient depletion. Typically one endospore is formed per vegetative cell. The mature spore is liberated by lysis of the mother cell (sporangium) in which it was formed. The formation of endospores is a complex and highly-regulated form of development in a relatively simple (procaryotic) cell. In all Bacillus species studied, the process of spore formation is similar, and can be divided into seven defined stages (0-VI). The vegetative cell (a) begins spore development when the DNA coils along the central axis of the cell as an "axial filament" (b). The DNA then separates and one chromosome becomes enclosed in plasma membrane to form a protoplast (c). The protoplast is then engulfed by the mother cell membrane to form a intermediate structure called a forespore (d) . Between the two membranes, The core (cell) wall, cortex and spore coats are synthesized (e). As water is removed from the spore and as it matures, it becomes increasingly heat resistant and more refractile (f). The mature spore is eventually liberated by lysis of the mother cell. The entire process takes place over a period of 6-7 hours and requires the temporal regulation of more than 50 unique genes. Pasteur Institute. Mature spores have no detectable metabolism, a state that is described as cryptobiotic. They are highly resistant to environmental stresses such as high temperature (some endospores can be boiled for several hours and retain their viability), irradiation, strong acids, disinfectants, etc. Although cryptobiotic, they retain viability indefinitely such that under appropriate environmental conditions, they germinate into vegetative cells. Endospores are formed by vegetative cells in response to environmental signals that indicate a limiting factor for vegetative growth, such as exhaustion of an essential nutrient. They germinate and become vegetative cells when the environmental stress is relieved. Hence, endospore-formation is a mechanism of survival rather than a mechanism of reproduction. Below. Drawing of a cross-section of a Bacillus endospore by Viake Haas, University of Wisconsin. In cross section, Bacillus spores show a more complex ultrastructure than that seen in vegetative cells. 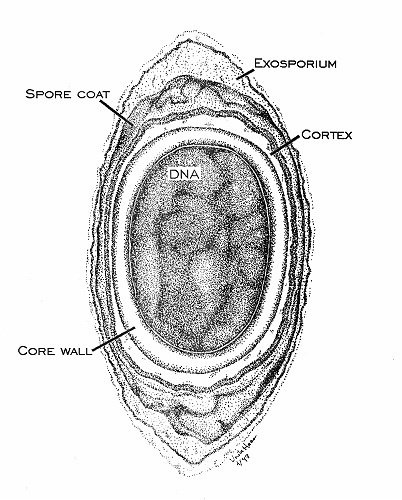 The spore protoplast (core) is surrounded by the core (cell) wall, the cortex, and then the spore coat. Depending on the species, an exosporium may be present. The core wall is composed of the same type of peptidoglycan as the vegetative cell wall. The cortex is composed of a unique peptidoglycan that bears three repeat subunits, always contains DAP, and has very little cross-linking between tetrapeptide chains. The outer spore coat represents 30-60 percent of the dry weight of the spore. The spore coat proteins have an unusually high content of cysteine and of hydrophobic amino acids, and are highly resistant to treatments that solubilize most proteins. Table 3. Differences between endospores and vegetative cells that form them.